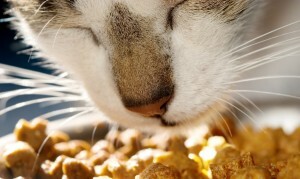 Solid Gold Brand Pet Food uses fresh meat in their pet food along with specific meat meals. 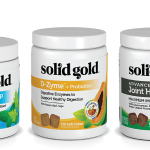 Solid Gold shares with us the benefits and reasons for their ingredient choices. To enhance the palatability and digestibility of their foods, Solid Gold adds fresh meat to most of their dry foods. Fresh lamb, bison, and beef arrive at the plant within 24 hours of slaughter and are used within 12 hours of arrival. Fresh meats are much more palatable than meals. Meal are cooked twice- by the meal supplier and again by the manufacturer. Fresh meat is only cooked once. Heat destroys many of the nutrients, flavor, and virtually all of the enzymes present. Since nutritional availability is higher in fresh meats, digestibility is also increased. Another major advantage of meat versus meal, is the reduced ash content. The fresh meats are mechanically deboned in a press, which separates the residual meat from the frame. The finished products therefore have a very low bone content and extremely low ash, compared with meals. Excess phosphorus and ash are primary contributors to kidney disease, the #2 non-accidental killer of dogs. Many companies recognize the importance of a low ash phosphorus content in their senior diets but ignore the issue in their adult maintenance formulas. 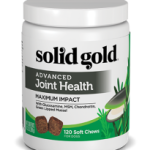 At Solid Gold they believe management and prevention of disease such as kidney failure are important throughout a pet’s life and they work hard to maintain healthful levels of several critical nutrients, including phosphorus and ash, to maintain the long term health of pets. In addition to incorporating fresh meats in their dry foods, Solid Gold also uses meat meal in each of their recipes. The reason for this is to achieve sufficiently high levels of protein in the finished products. Fresh meat contain up to 70% water and only about 15% protein by weight. Meals are only 10% moisture an 65% protein. By incorporating both fresh meats and meals in to the foods, Solid Gold is able to take advantage of the benefits of both. Solid Gold is committed to providing the best all-natural food, treats, supplement, and skin care products for your pets. To find a Solid Gold retailer in Minnesota, Iowa, Nebraska, North or South Dakota use our store locator. For all other areas click here.